Gastrointestinal Stromal Tumors in Younger Patients: A Start but More to Do! Although uncommon, gastrointestinal stromal tumors (GISTs) represent the most frequent mesenchymal tumor of the gastrointestinal tract. Our understanding of GISTs evolved after the discovery of KIT proto-oncogene receptor tyrosine kinase (c-KIT) and platelet-derived growth factor α (PDGFRA) mutations. 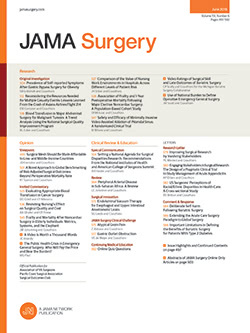 Although GISTs are generally found in older adult (OA) patients, in this issue of JAMA Surgery Fero et al1 examine the occurrence of GISTs in adolescent and young adult (AYA) patients identified in the Surveillance, Epidemiology, and End Results database.